VOCZero offers a range of Vapour Recovery Systems (VRU) for recovery of relatively low concentrations of volatile organic compounds from vapours. These systems are in particular well suited for areas, where extreme low VOC emission in the ppb-ppm level is required, like in many petrochemical facilities. The process is based on adsorption of VOCs on activated carbon followed by steam regeneration of the carbon. This technology is valued to be among the best available, for applications like storages and loading operations. The design and selection of parts are made to achieve a durable, safe and efficient process plant, and are based on international standards recognised in the oil and gas industry, such as ASME VIII, ASME B31.3, EN 60079 & EN 1127. The VRU’s are designed to meet the stringent health and safety requirement set out by European ATEX and Machinery directives. 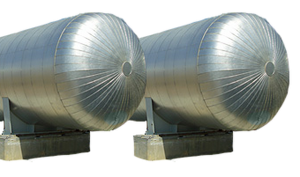 Low VOC concentration vapour from storage tanks or other VOC handling facilities, typically having VOC concentration in the range of 1 – 4%vol., is collected in a sealed vapour header, and passed to one of two activated carbon filter in the VRU. The VOC vapour will flow down through the activated carbon layer, where the VOC molecules are adsorbed onto the surface of the activated carbon, while the inert gas/air exits the filter vessel at the bottom. When the activated carbon reach saturation, the regeneration process is initiated. 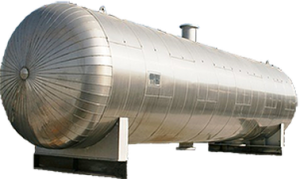 The activated carbon are thermally regenerated by means of steam. As activated carbon has a much higher affinity towards water molecules than VOC, the carbon readily releases the VOC molecules, when 100 degC steam is passed up through the activated carbon bed. 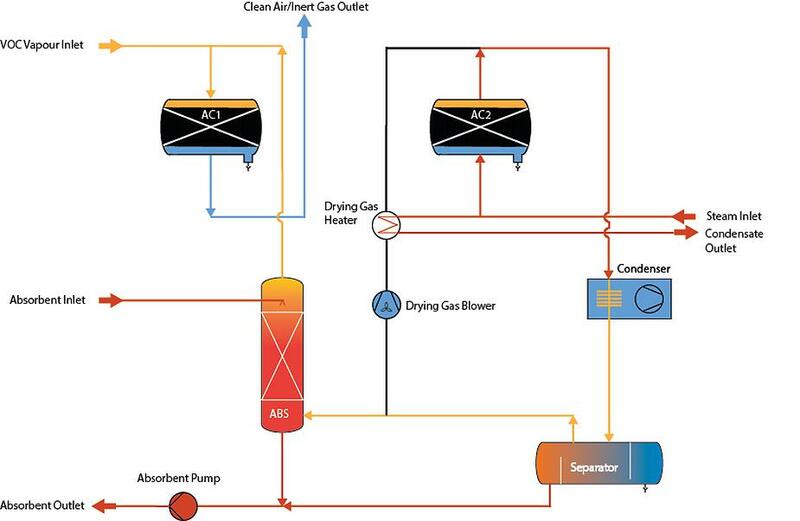 Steam regeneration will take place until the activated carbon and vessel is heated up, and a temperature break-through is detected in the top of the activated carbon filter vessel. The released VOC and steam will flow to an air-cooled condenser, in which the steam will be condensed, and following drained off in a separator. From the separator the pure VOC vapour is passed to the bottom of a packed absorber column, in which the VOC vapour will be partly absorbed, partly condensed, into a stream of a suitable absorbent media, taken from a nearby storage tank. The absorbent now containing the recovered VOC, is collected in the bottom part of the absorber, and pumped back to the storage tank. After regeneration, the activated carbon must be dried, and subsequently cooled down, before the carbon bed is ready for another adsorption cycle.